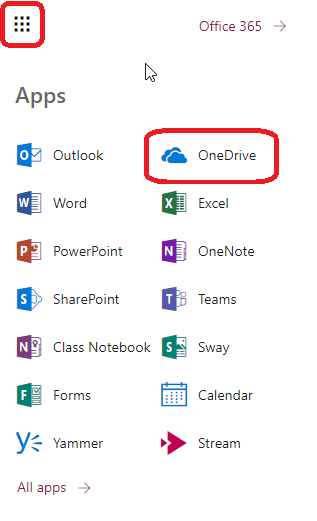 This document provides an overview of how to share a file or folder stored in OneDrive with other people. 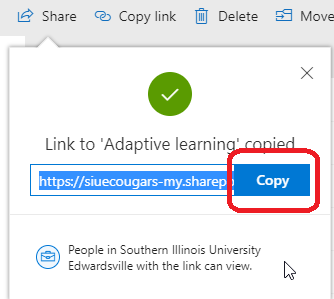 Note: Only people with siue.edu or Microsoft email accounts can access content shared from OneDrive. They must log into their accounts in order to access it. 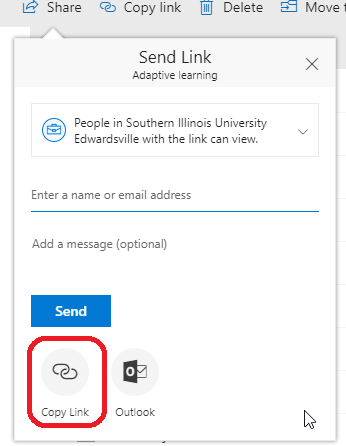 Log into your OneDrive account at office365.siue.edu. Click the Apps button in the upper left-hand corner of the screen. Place a check mark in front of the file or folder you wish to share. Click the Share button near the top of the screen. Notice when you click "Share" the default sharing permissions are set to "view." If you want the people you are sharing with to only view your material, skip to step 7. If you want people to "edit" the content, follow the next three steps. 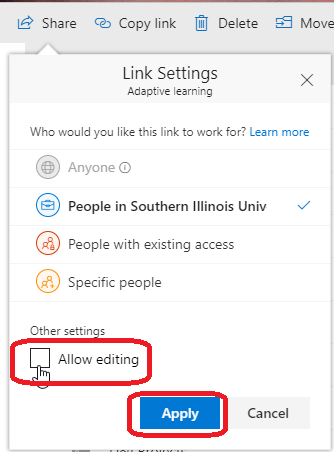 Click the box where it says, "People in Southern Illinois University Edwardsville with the link can view"
In the next window, check the box next to Allow editing. After you have chosen whether recipients should be able to "edit" or just "view" your material, click Copy Link. The link will generate. Click the Copy button to copy the link text to your clipboard. Paste the link into an email, Blackboard announcement, or other method of communication to share with invitees.